The title of this post is misleading. 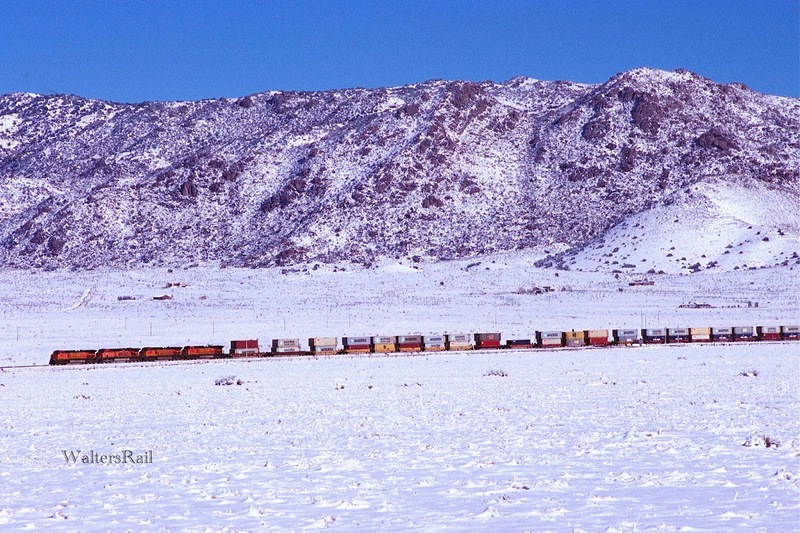 Although I recently have taken several snow shots around Abo Canyon, I have not taken any within the canyon. In the year of our Lord 2016, Abo Canyon is off limits. 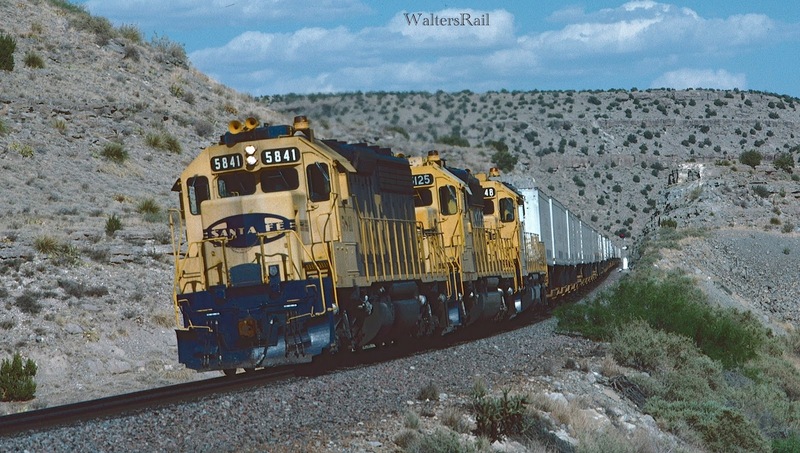 When I first visited in 1981, you could stop at the Yard Office in Belen, sign a release and then drive all over the place without any railroad employee caring at all. 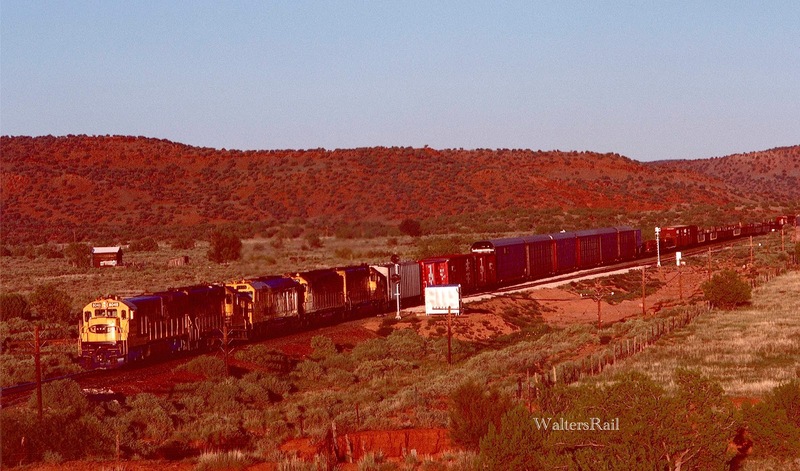 If you drive into the canyon today, you will be accosted almost instantly by railroad employees, railroad police and God only knows who else. When the snow shots were taken in this post, in December 2015, I had half a notion to hike into the canyon. 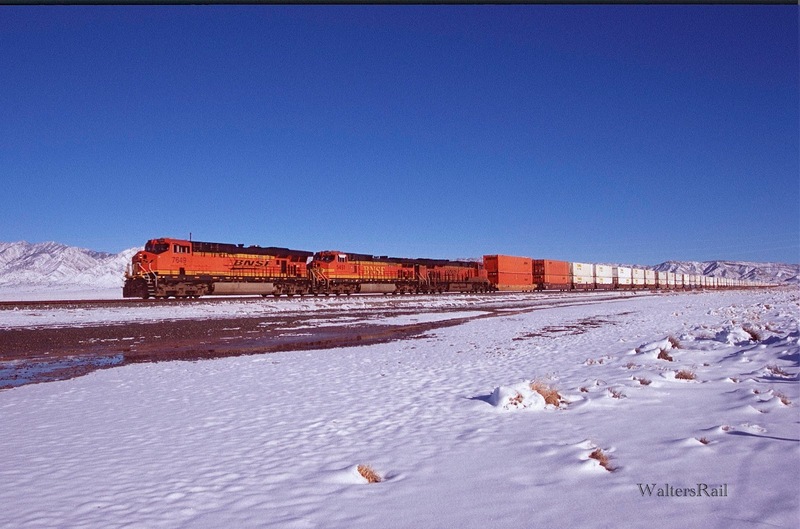 However, while I was standing on the highway bridge over the tracks at the east end of Abo, three separate BNSF maintenance vehicles drove in, and only one drove out, stopped along the highway about 100 yards from my Jeep and watched me for about 45 minutes. I have no doubt that someone called in a report about a possible trespasser. So then I thought that perhaps I could hike along the fence line just outside the railroad right-of-way. But then I remembered what had happened when I tried something similar along the Craig Branch in Colorado and discovered that the land owners had placed closed-circuit television cameras in the pine trees -- to spot trespassers like me. I was spotted, and I was run out. I gave up the idea of driving or hiking into the canyon. The snow shots in this post are "around" Abo but not in it. Sorry! However, I have supplemented my snow shots with images from within Abo Canyon in the 1980's -- 1981 through 1989 to be exact. 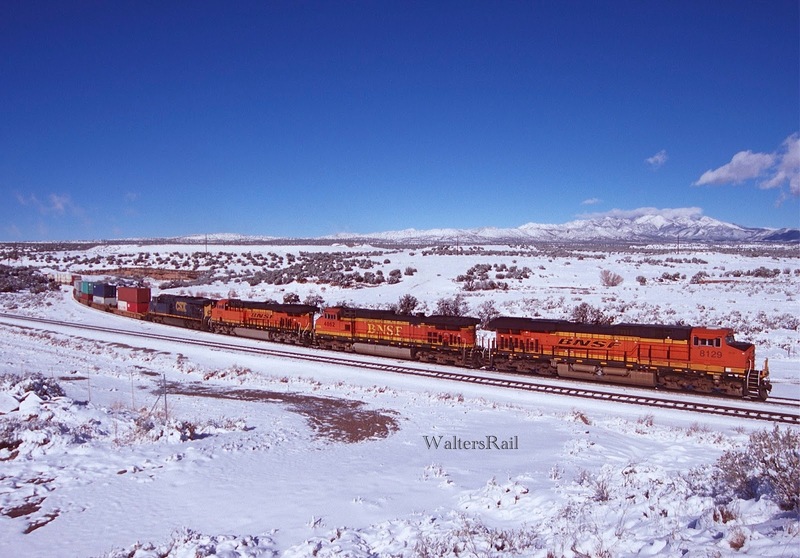 Thus, you will see the contrast between BNSF practice in the early 21st century and Santa Fe practice in the late 20th century. As I grow older, I find myself slipping into the "things ain't what they used to be" mode. This is a natural part of the aging process, and I can confirm that growing old is interesting. Would I go back and relive my younger years? Absolutely not! 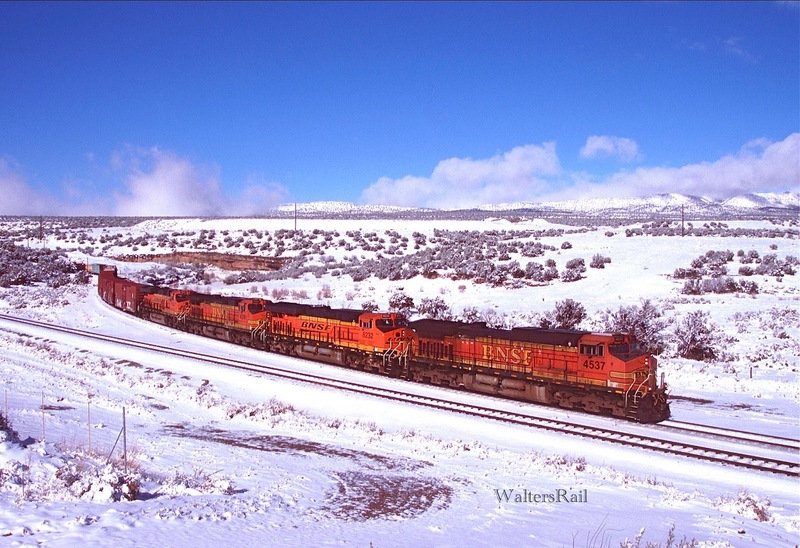 Nonetheless, I enjoy the BNSF every bit as much as I enjoyed the AT&SF. For those my age, I refer you to an old song by Gene Clark and Bernie Leadon: "Train Leaves Here This Morning." 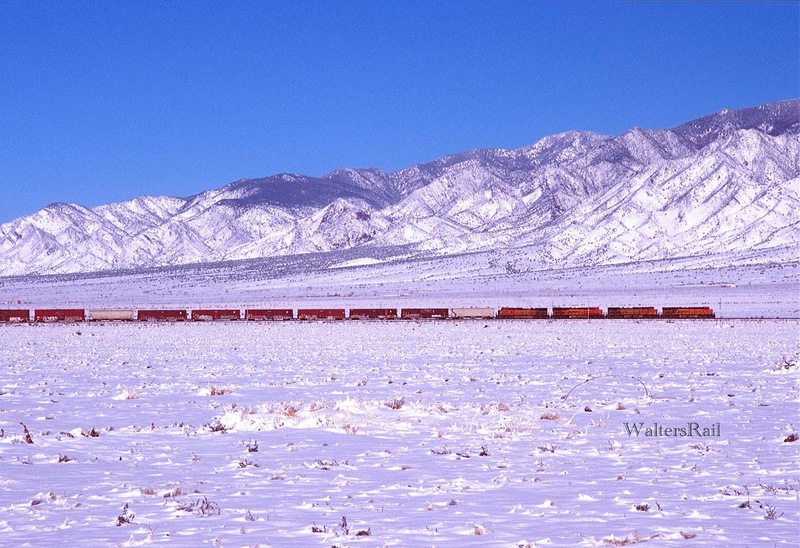 The chorus from that song is: "There's a train leaves here this morning; I don't know . . . what I might be on." 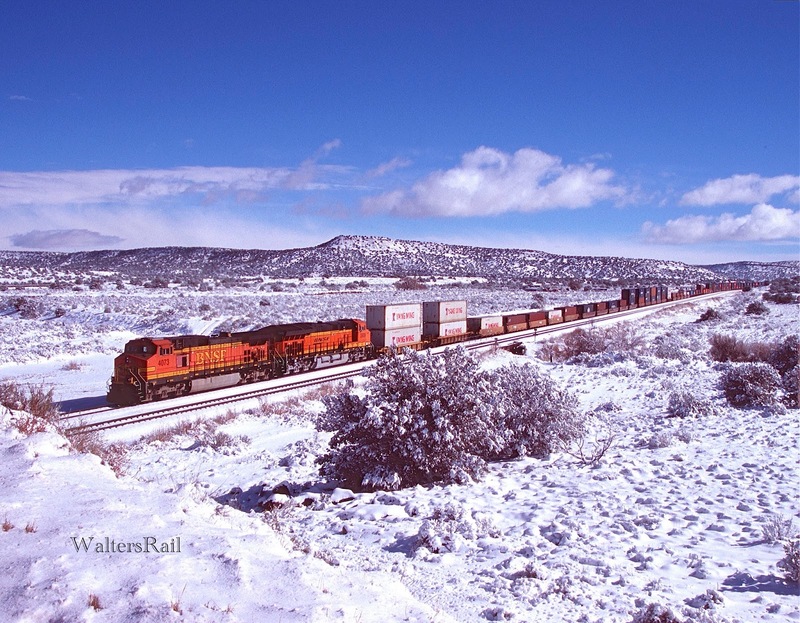 Shortly before Christmas in 2015, my dog Bear and I drove to Vaughn, New Mexico, with the idea of taking some images of the second track on the Vaughn Flyover which the BNSF was constructing to eliminate one of the few remaining bottlenecks on the Transcon. We left Edmond, Oklahoma, about noon and reached the Texas Panhandle as the sun was descending. As we drove across eastern New Mexico in the dark, rain began to fall in torrents, and the temperature began to drop rapidly. We stopped along I-40 at the information center and chatted with a friendly woman who lived by herself in a small house on the New Mexico high plains. Bear did his "business" in the cold, gusty wind, then we climbed into my Jeep, turned the heater up a notch or two and headed west as the temperature continued to drop. 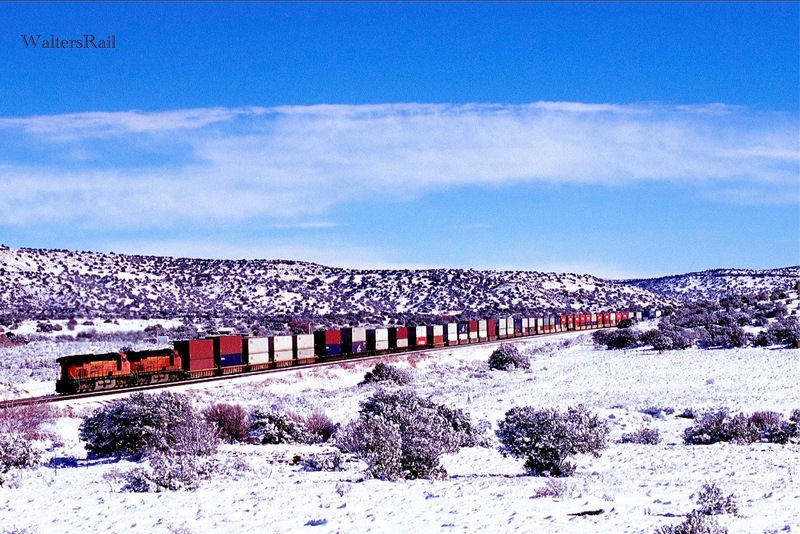 When we woke the next morning at the Oak Tree Inn in Vaughn, where Union Pacific crews lay over between runs, I opened the curtains and looked out upon ten inches of snow and a cloud cover like the lid of a coffee pot. I ate breakfast at Penny's Diner, while Bear (a tiny dog weighing less than 10 pounds) waited in his little bed in the room. I checked the satellite photographs and discovered that the sky was clearing near Belen at the Rio Grande River, so Bear and I climbed back into the Jeep and headed west. Bear fell asleep, and I looked for a break in the clouds. 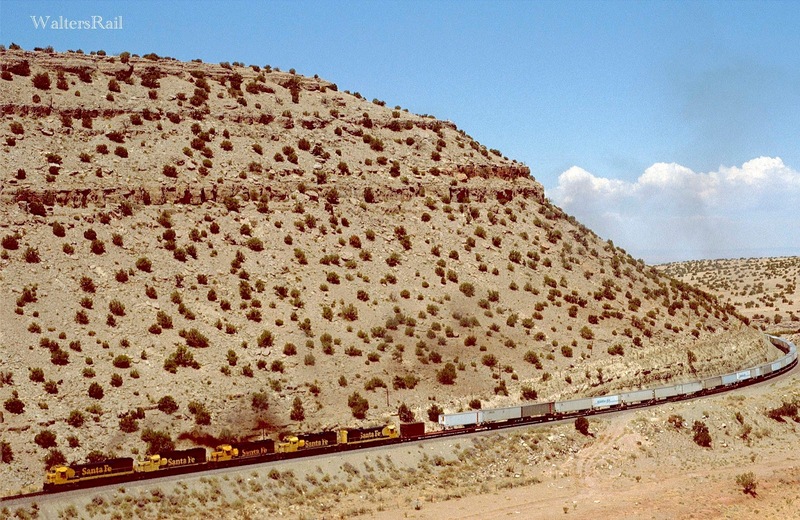 When the line through Abo Canyon was single track, the AT&SF would "fleet" trains. Four to five eastbounds would come through -- one after another -- then four or five westbounds. Now that the line is double-track, trains come through in fairly random order. 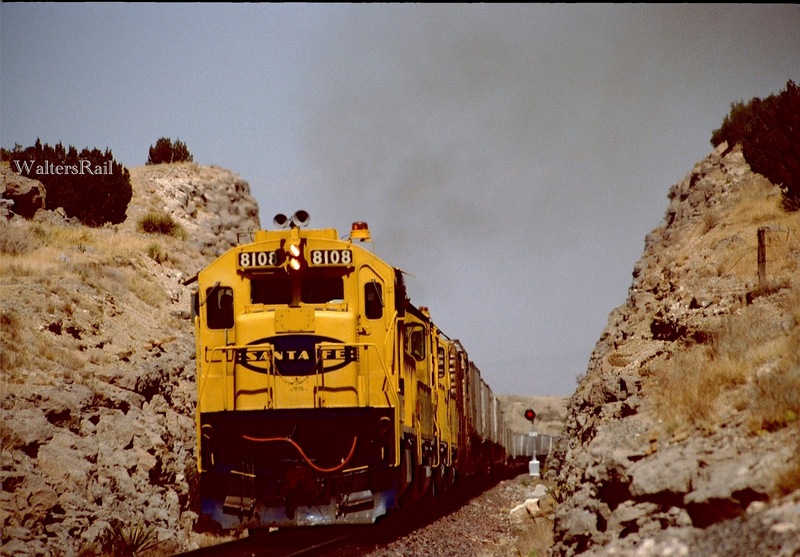 But if you were photographing trains in Abo Canyon in the 1980's, or earlier, you noticed how the trains "took turns," and you also noticed how narrow was the route through the rock canyon walls. The line was constructed in the early 20th century, when the tools of the trade were mules, picks, dynamite and steam shovels. 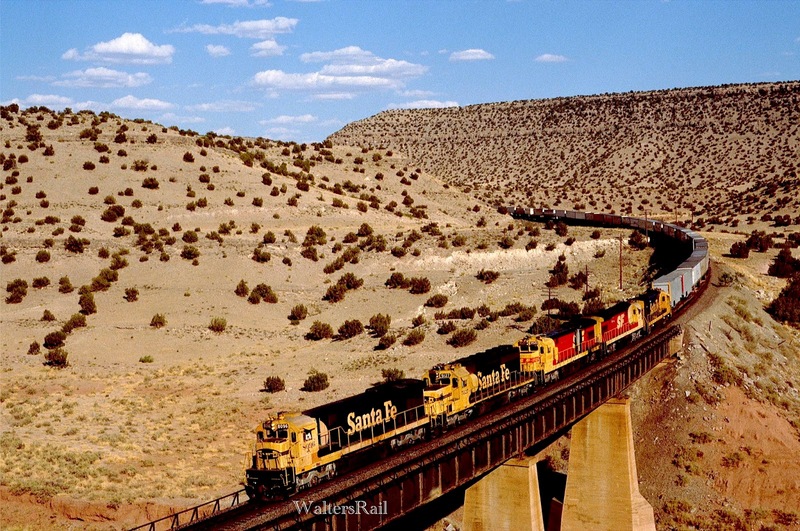 So it is little wonder that the cuts through the rocks were just barely wide enough for a single train to squeeze through. I am amazed that construction crews, one hundred years ago, could clear enough ground for trains to pass. 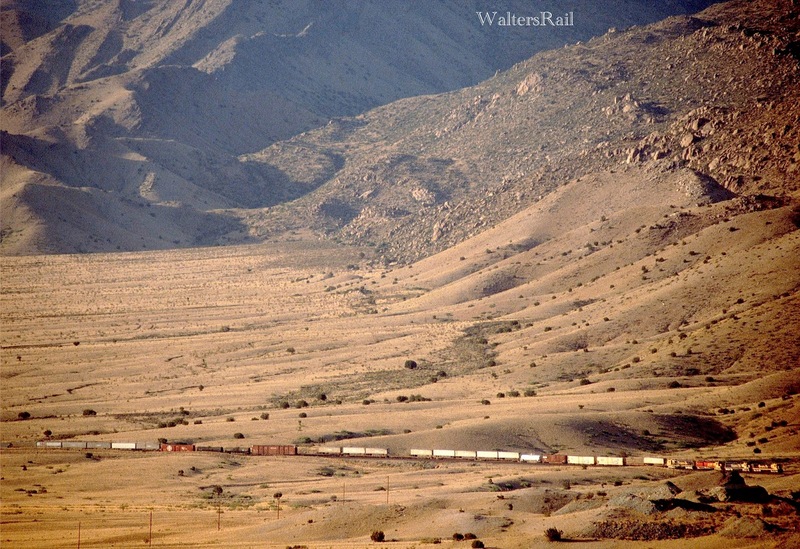 Yet the single track line through Abo Canyon served the railroad well until construction on the second track started in the 21st century. 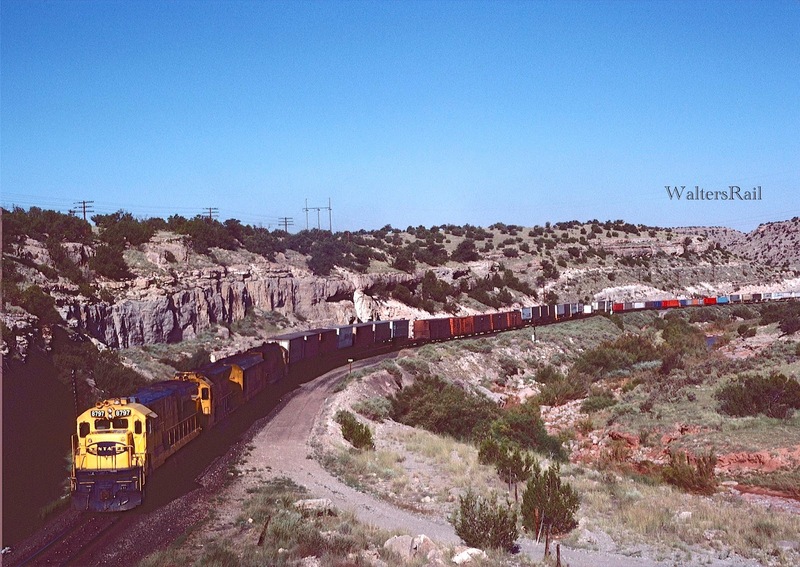 Today trains do not wait before entering the canyon, and traffic is heavy in both directions. When Bear and I arrived at Mountainair that morning, I could see low clouds beginning to break to the west, but I could not speed up because the highway was snow-covered and slick. I had passed two stranded vehicles that morning, stuck in the snow beside the road, but both were abandoned, so I could not offer help to the drivers. One advantage of a Wrangler Rubicon is that snow is no impediment, though ice is another matter. Four-wheel drive and lockers don't help much after one has lost traction. I had never seen this country in snow before. 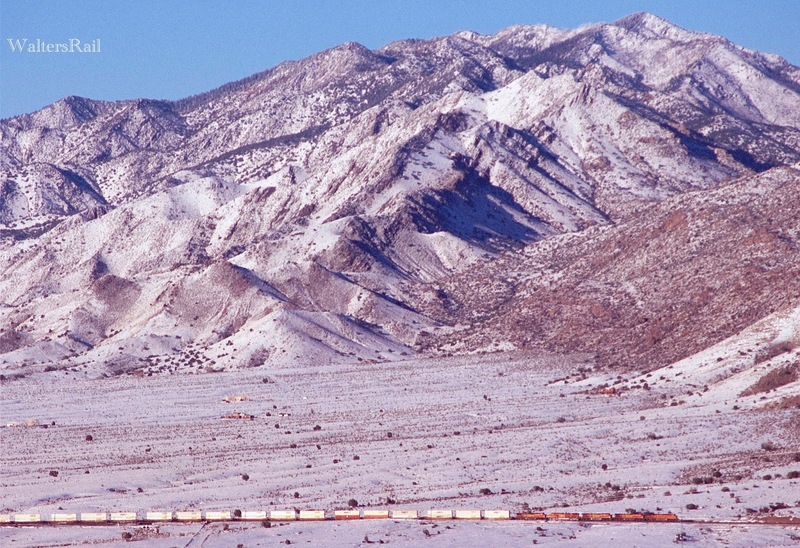 According to National Weather Service records, Mountainair, at the top of the grade, receives about thirteen inches of snow per year. Belen, at the bottom in the valley of the Rio Grande, receives about five inches. Abo Canyon lies between. I have been unable to find average snowfall for the canyon, so my best SWAG is an average of 7-8 inches per year. The area where I live in central Oklahoma receives an average of about five inches of snow per year. Snow shots are difficult to take, because the frozen precipitation usually melts quickly after it falls. I suspect the same is true in and around Abo Canyon. I was therefore thrilled to find so much pristine snow. Bear was less enthusiastic. He is a "Chihuahua mix," and I'm not sure what the "mix" is. He has very short black hair, and anytime the temperature drops below 40 degrees, he shivers. It was about 25 degrees when we arrived. His legs are so short that he disappeared into the fresh snow, so I picked him up, dusted him off and carried him to the highway overpass where, because of the sun angle, I could shoot trains in both directions. I cleared the snow from an area about the size of a large suitcase so that Bear could stand on the grass. When he is unhappy with me, he looks the other way and won't wag his tail. I placed him on the ground, and he turned away and stared at the snow. His tail was motionless. He began to shiver. To myself I said, "Why are you allowing such a small dog to rule your existence?" I did not have a good answer. After photographing two trains, I carried him back to the Jeep where he burrowed into his blankets to keep warm. 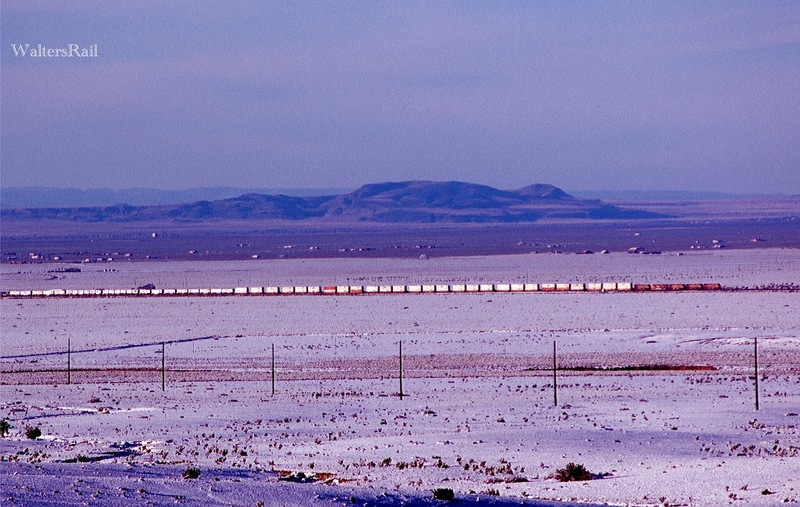 The two images above were taken at the same location, though from different sides of the track because of the sun angle. You will notice that in the older photograph there is no second track. Also the east entrance to the canyon is now wide open where 30 years ago the entrance was a narrow cut in the rocks. These two images clearly show the advances in construction techniques over the past 100 years. According to the web site of the General Contractor, Ames Construction, "approximately 1,800,000 cubic yards of rock excavation was completed near the existing railroad tracks in 10 months." 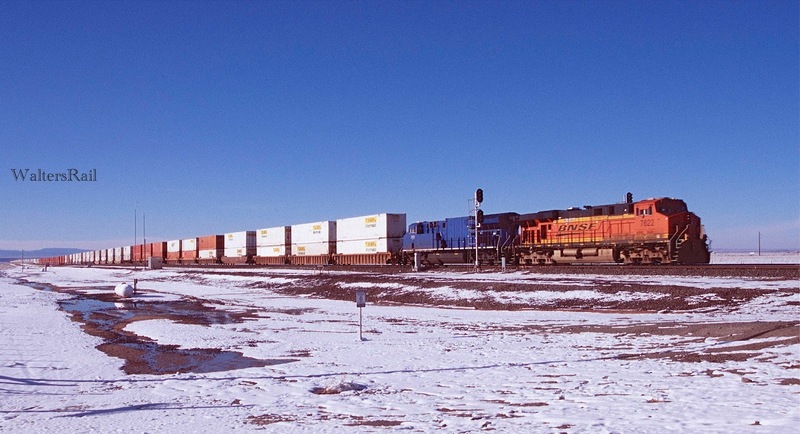 According to November/December 2008 issue of Railway, the BNSF employee magazine, about 150 people were involved in the construction. I have seen estimates as high as 5,000 for the number of workers involved in the construction of the original line through the canyon. Some things don't change, however. Initial construction through Abo Canyon was slowed by a financial panic. Almost 100 years later, construction of the second track was similarly hamstrung by the Great Recession of 2008. During construction of the second track, the civil engineers combined portions of the original line with portions of the new line to create two tracks with fewer sharp curves than the original. This was confirmed for me by the speed with which westbounds entered the canyon. 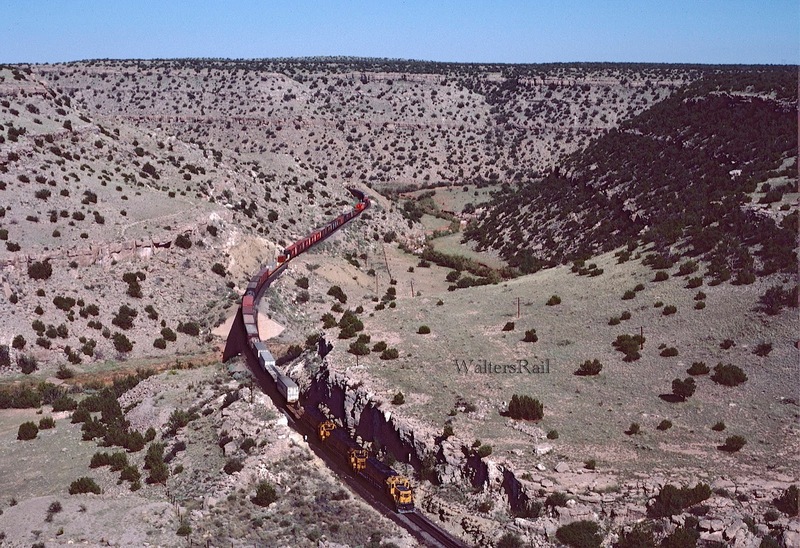 In years past, trains west would approach the eastern canyon entrance slowly and carefully at Scholle, where the double track line from Mountainair became single track. 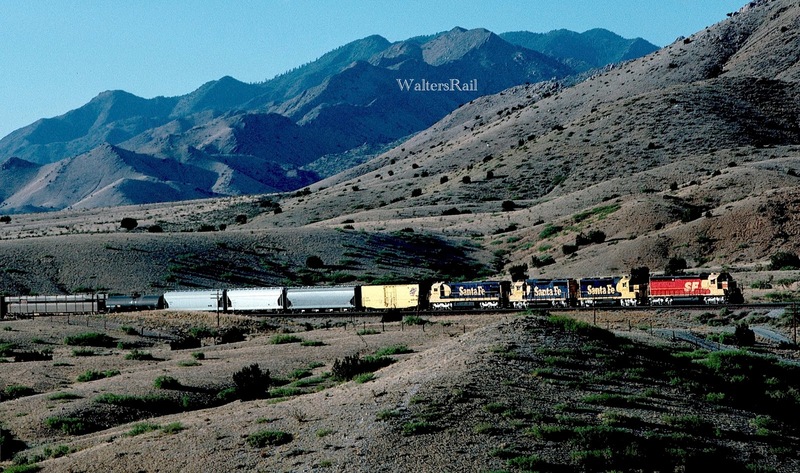 Ahead lay approximately five miles of narrow canyon walls, steep cuts and sharp curves. Today, westbounds move at a speed that would surely have caused derailment before the lines were straightened. The above location is Scholle, the beginning of the single track through the canyon. This train was running about 15 MPH. 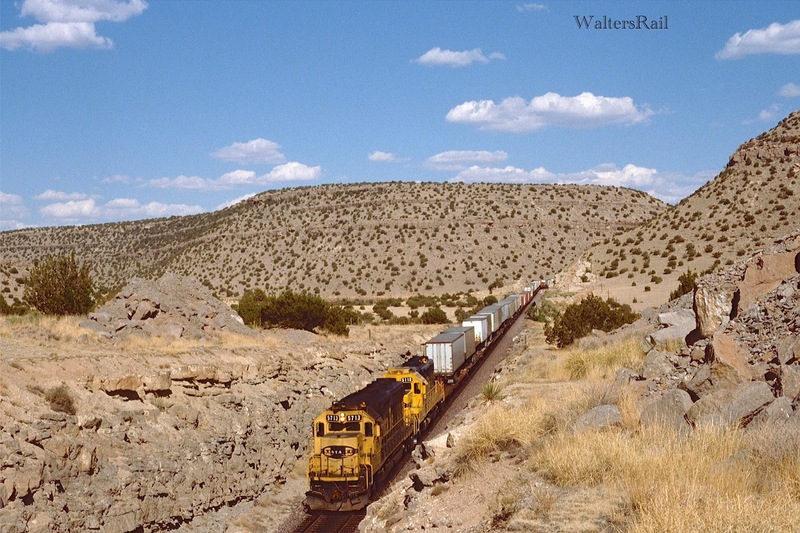 Until recently, I did not know that BNSF had at least toyed with the idea of building a tunnel under the Manzano Mountains rather than a second track through the Canyon. 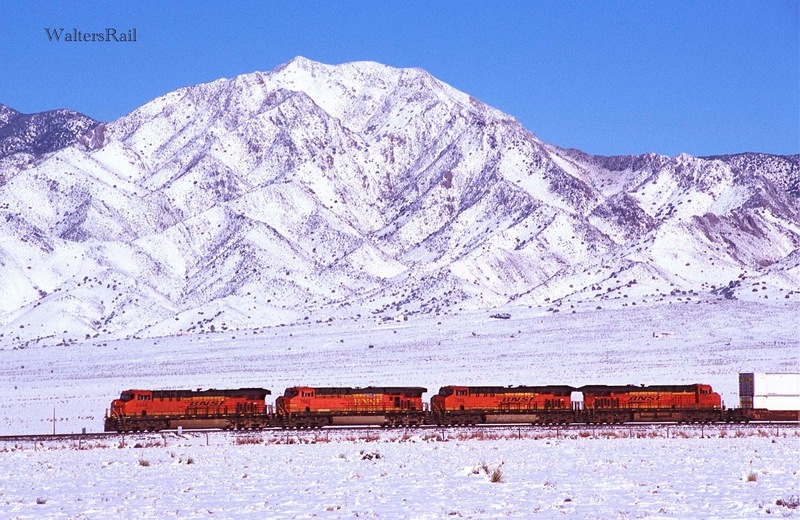 Two alternative tunnel routes were proposed -- one north of the canyon at about 7,500 feet, the other south at about 18,000 feet. The railroad apparently even considered building two lines through tunnels and abandoning the single track in the canyon. I believe tunneling options were considered because of ecological concerns raised by the surrounding land owners. Obviously, tunnels were not constructed. However, since access to the canyon is now restricted, the tunneling option would not have limited photographic opportunities any more than the current situation. For those interested in a more complete discussion, consult "faculty.washington.edu/nemati/abo_report1.pdf," a report that may or may not have ever been seriously considered by BNSF. 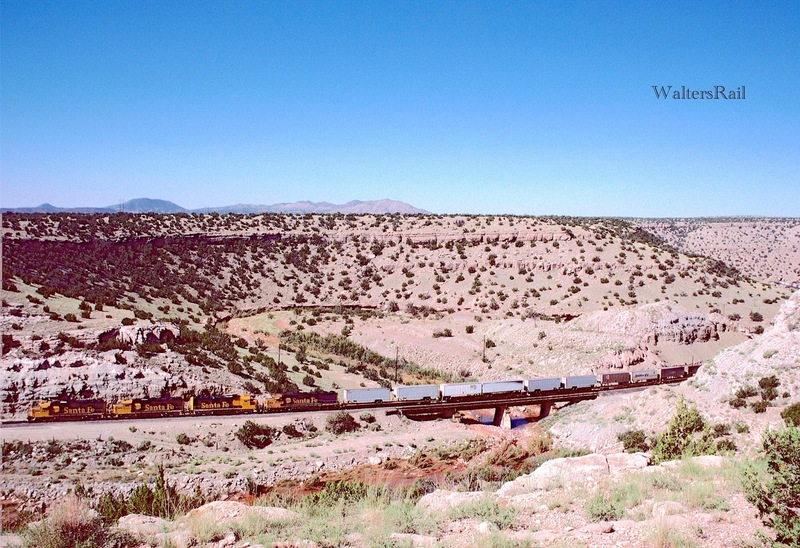 Still, the idea of a tunnel through the Manzano Mountains is intriguing. 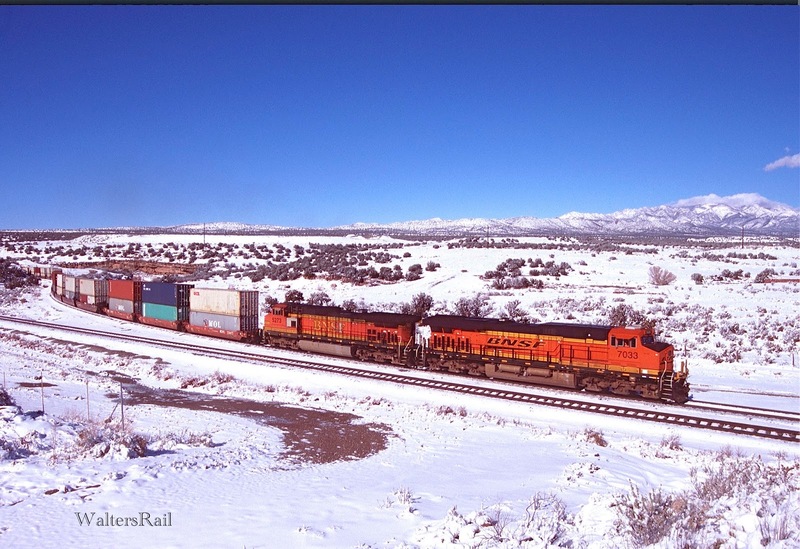 One of the biggest operating differences between the 1980's and 2015 is the use of DPU's by BNSF. 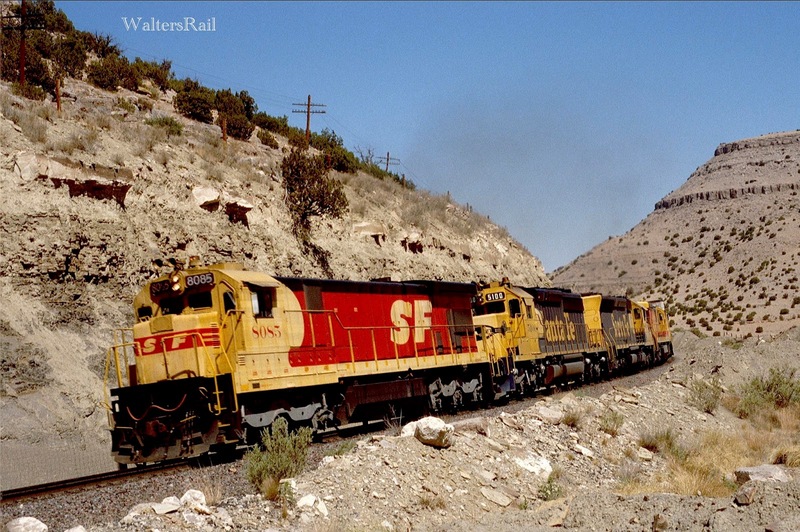 I do not remember seeing helper units on AT&SF trains through Abo Canyon. I certainly have no such photographs. Of course, in those days, helper units generally were manned, with added crew costs. There was a primitive form of un-manned power that I believe was called Locotrol. 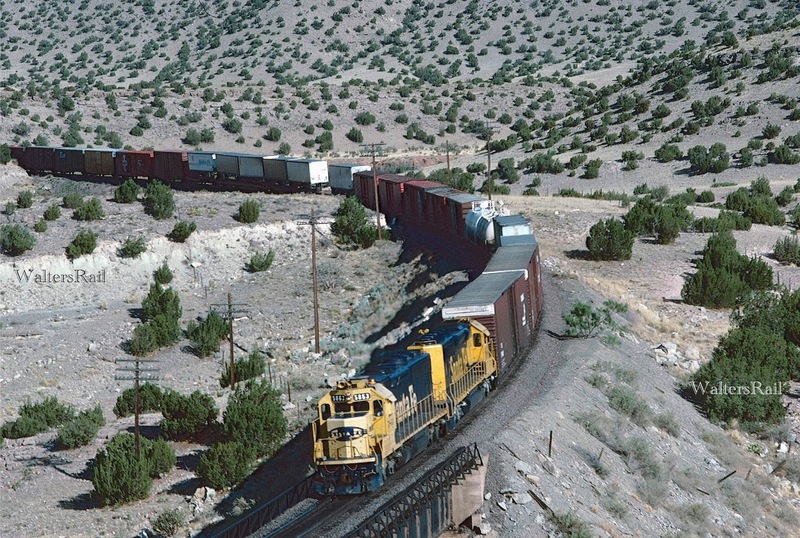 The KCS used this technology to help trains over Rich Mountain, but the KCS had enormous difficulties and eventually abandoned the scheme. 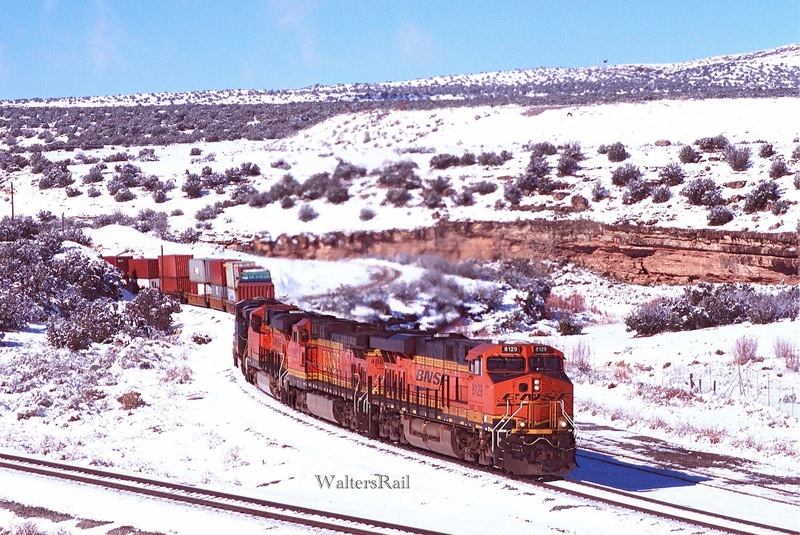 In any event, pushers on BNSF trains through Abo Canyon are quite common -- in both directions -- especially on the enormous stack trains, some almost two miles in length. The train immediately above was crawling upgrade at about 15 MPH and took a very long time to clear the overpass on which I stood. It took so long, in fact, that I walked back to the Jeep to make certain that Bear was not too cold. He seemed annoyed that I had opened the vehicle door and burrowed deeper into his blankets. Traffic was quite heavy -- seven trains in a little over one hour -- so I decided to head over the summit to the west side of Abo Canyon. 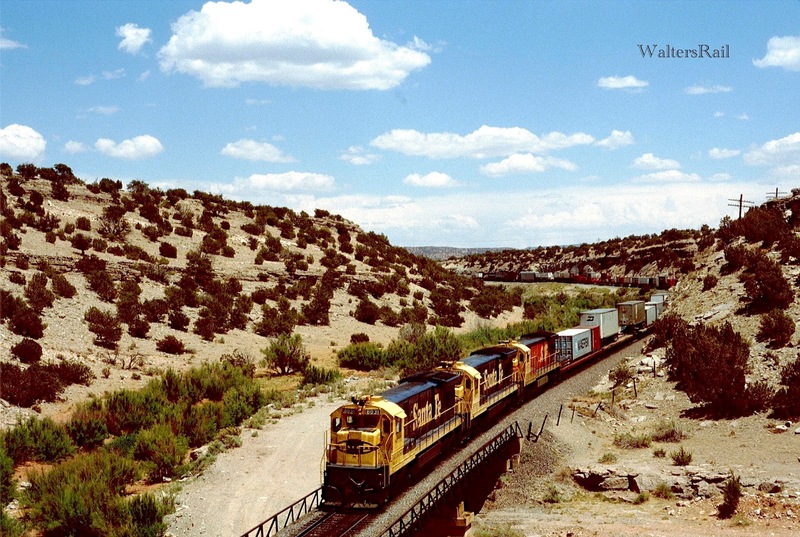 The highway crosses the mountains on a shallow grade, and beyond the summit, one looks down into the spectacular valley of the Rio Grande. 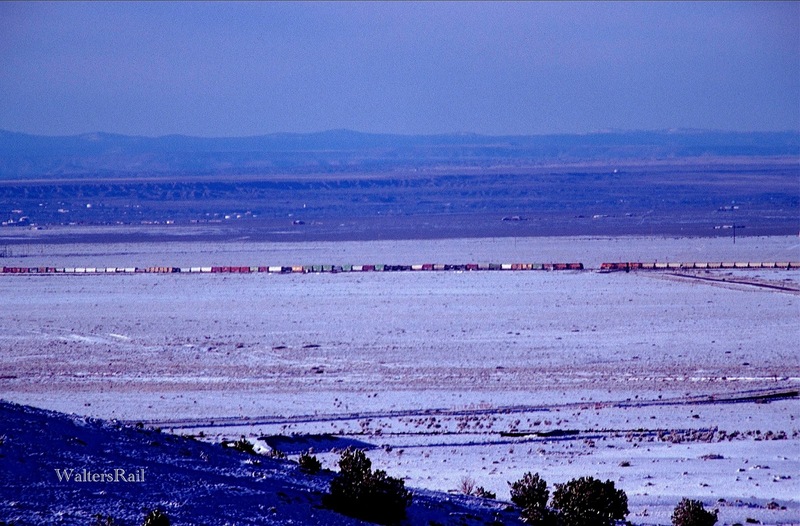 On this day, the sight was even more grand, because the valley was covered with snow. The view from U.S. Highway 60 was stunning. 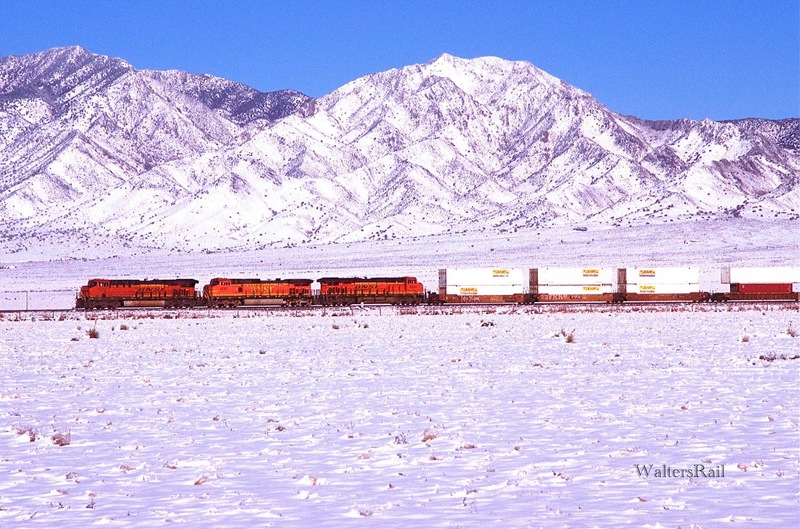 The Mazano Mountains looked like mounds of vanilla ice cream sprinkled with chocolate, and trains below crawled out of the canyon and into the valley like strands of silk. Because snow absorbs sound, the entire landscape was silent, as though in mourning for a lost civilization. 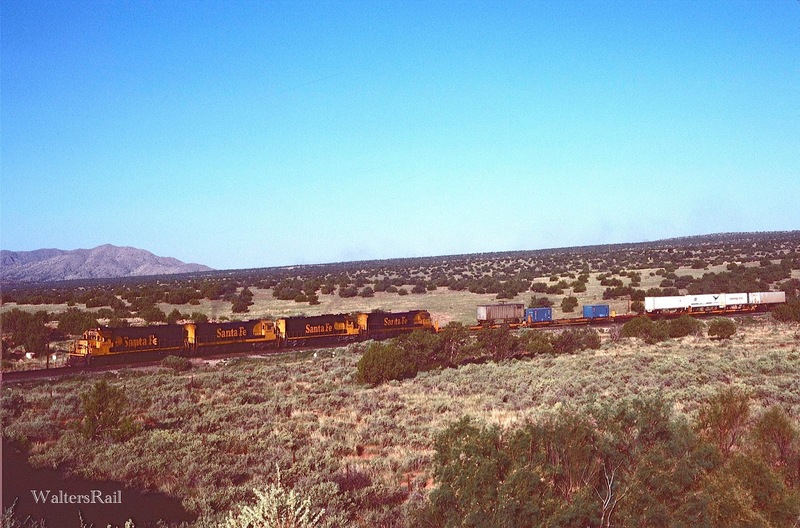 I could see for miles, including the meet of two trains immediately below. The second image above appears crooked, as though the camera were not aligned with the horizon. In fact, however, what you see is the valley floor sloping upwards to the Manzano Mountains. Taken with a film camera and a 400 mm lens, the photograph gives you some idea of the enormous distances. 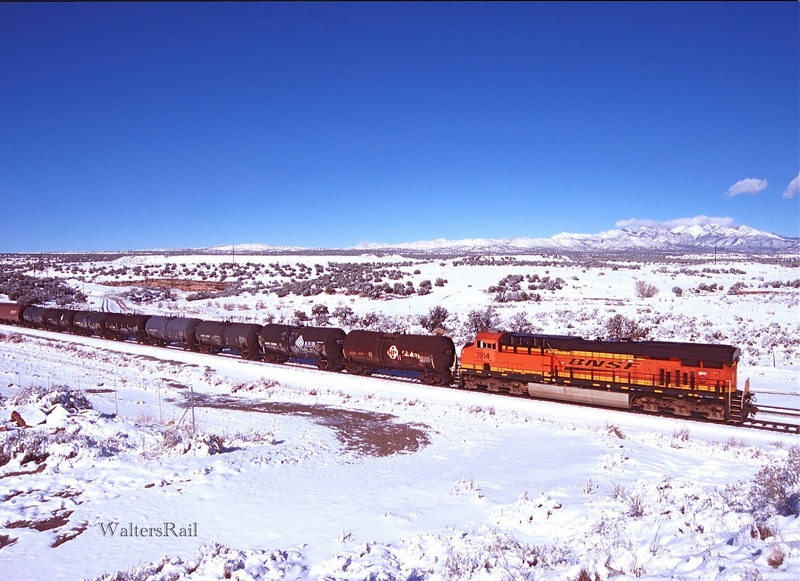 The image immediately above is another meet at track speed with the Manzano Mountains as the backdrop. Below are photographs from the same locations as the second and third images above, taken in 1981 and 1989. 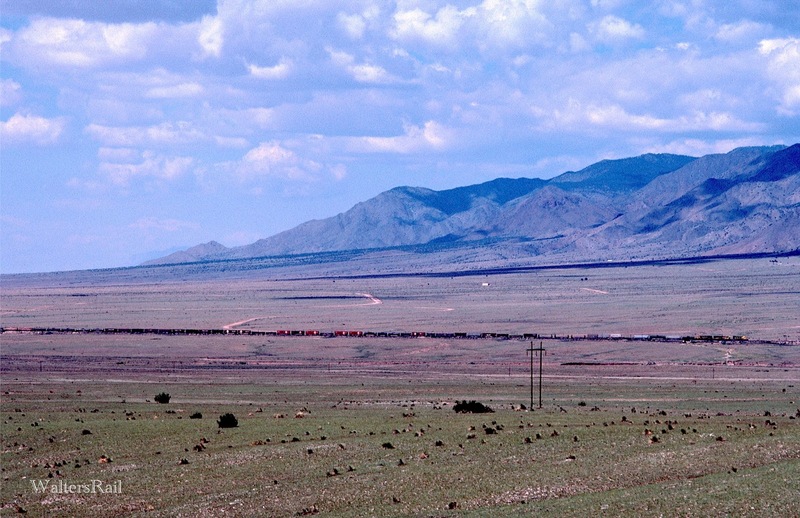 On the west side of the Manzano Mountains, state highway 47 angles to the south from U.S. 60 and roughly follows the Transcon downgrade into Belen. 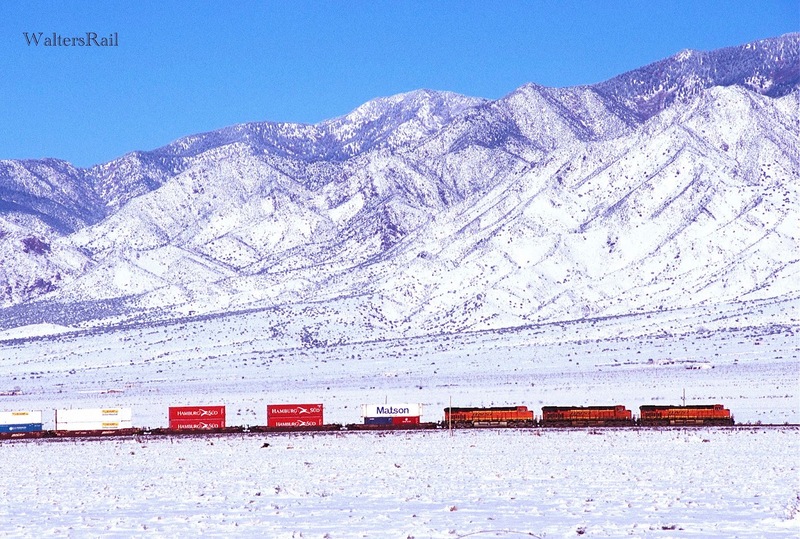 From the side of the highway, one can take afternoon shots of trains running in both directions, with the mountains in the background. The snow here in early afternoon was deep, but as the temperature rose, I noticed melting. I tried to coax Bear out of the Jeep, but again he sank into the snow up to his snout. He was not happy, so I allowed him to urinate on the left rear tire of the Jeep, then put him into the back seat and his blankets where he looked serene. I waded into the snow along the fence line and waited for trains. 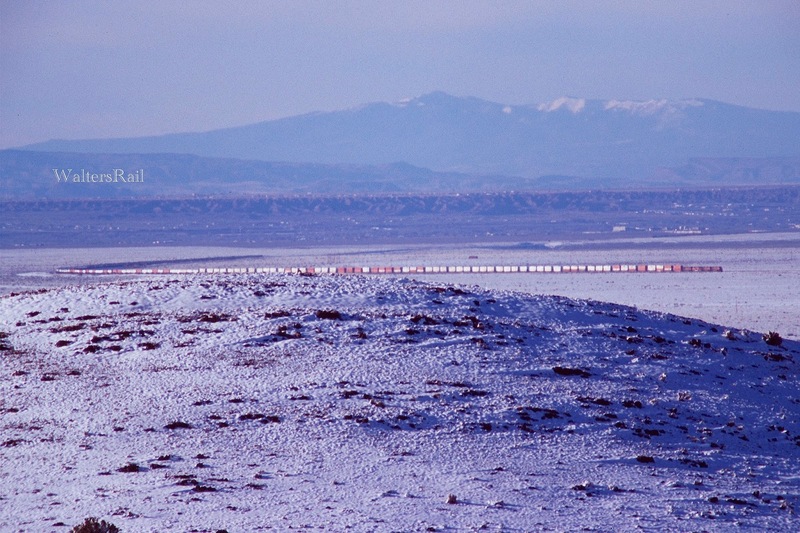 Abo Pass for centuries provided the route through the Manzano Mountains from the plains of the Estancia Valley to the east and the pueblo cultures. 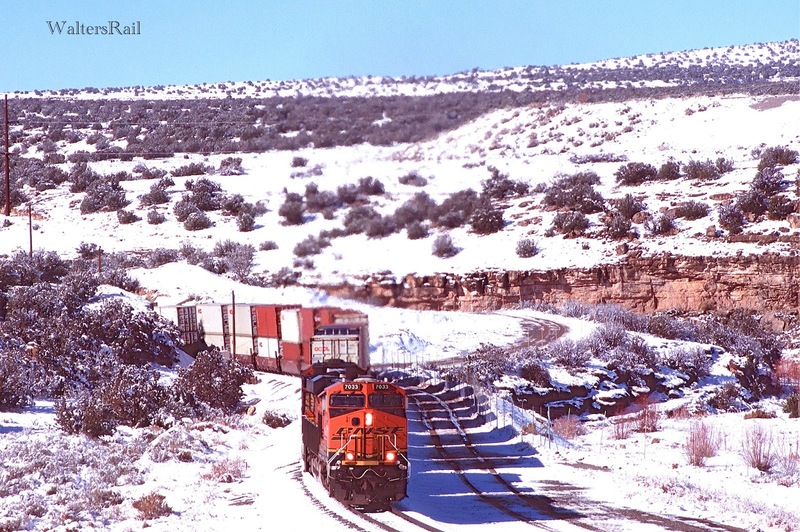 The route through the canyon passed Abo Pueblo, dating from at least the 14th century, located near natural springs on the eastern slope of the pass. In the 16th century the Spanish arrived, constructing missions along the way. Ruins of one mission are preserved today as part of the Salinas Pueblo Missions National Monument. I have spent several days there examining and photographing the ruins, trying to decide what the Spanish must have been thinking. Their stated motives were Christianity and gold, but I've always wondered if something more wasn't involved. At that time, Spain was arguably the most powerful country in the world. All the gold brought back from the New World ended up devaluing the Spanish currency, a classic example of falling on one's own sword. But what would cause a man to leave his home and sail thousands of miles to a virtually unknown territory? I like money and identify myself as a Christian, but I have no desire to sail away into the unknown. The motives behind such actions remain hidden to me, as are so many other of life's mysteries. As the sun descended in the west, I noticed that not only was the snow melting but also that to the north the mountains were snow free. Apparently, snow had fallen in a narrow zone from northeast to southwest. Fortuitously from my perspective, the Transcon ran directly through the middle of that narrow belt. In the foreground of this image are the legs of an enormous spider, or perhaps the remnants of John Carpenter's "The Thing." I keep thinking Kurt Russell will show up sooner or later. Highway 47 crosses the tracks at grade, which means that vehicles are constantly waiting for one or more of the parade of trains to pass. This location also provides plenty of room to pull off the road and photograph trains, as I have done repeatedly over the years. 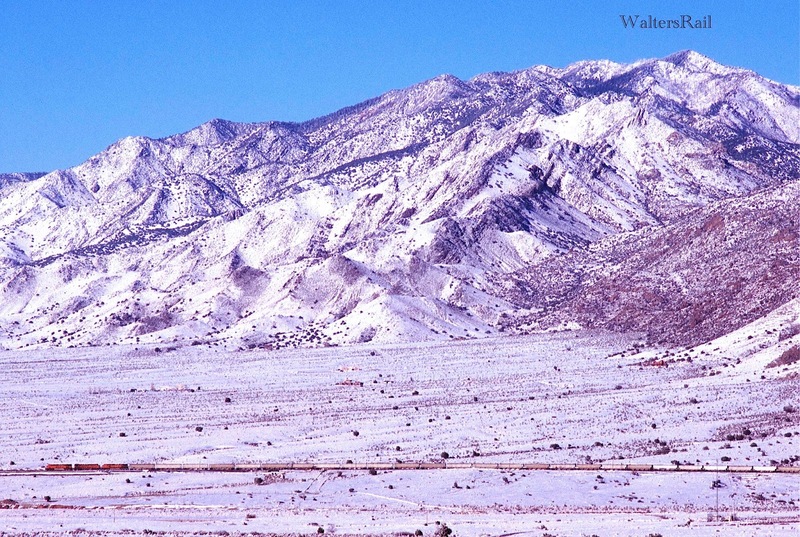 As these images demonstrate, the snow was melting rapidly in the valley. On the mountainside, however, the drifts were still deep. Fortunately, traffic remained heavy, so I was able to take a number of shots that I likely will never be able to duplicate. Bear remained quite content to stay in the Jeep, while I tromped along the fence line through the snow, snapping one intermodal after another. 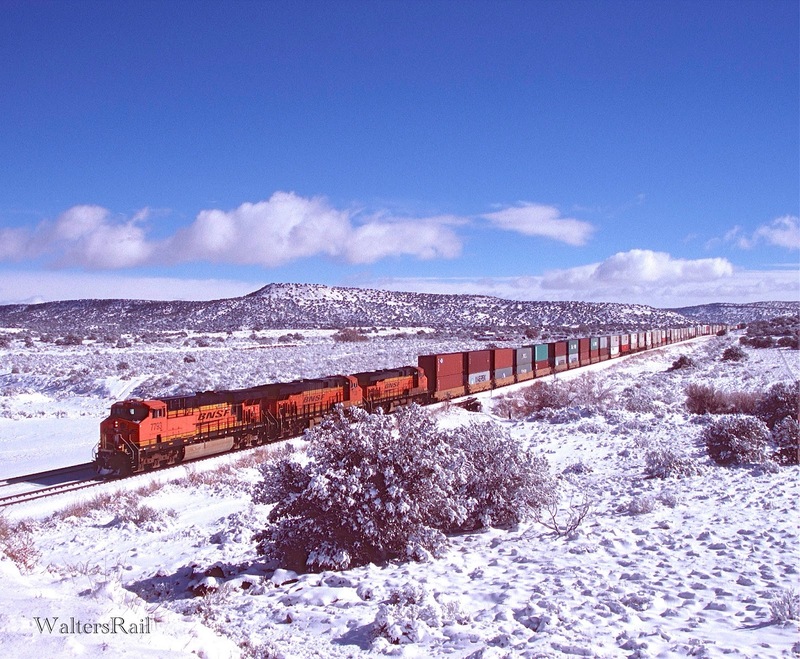 Sometimes, traffic on the Transcon is breathtaking, and this was one of those days. My wife Alexis was with me when I took the above image. I asked her to take a look to see if she remembered anything about the trip. She did. She remembered being hot, tired and hungry. She said, "Now I remember why we didn't take any more trips for several years." So I didn't show her any more photographs. The snow images, sadly, don't give any idea what the canyon looks like today. 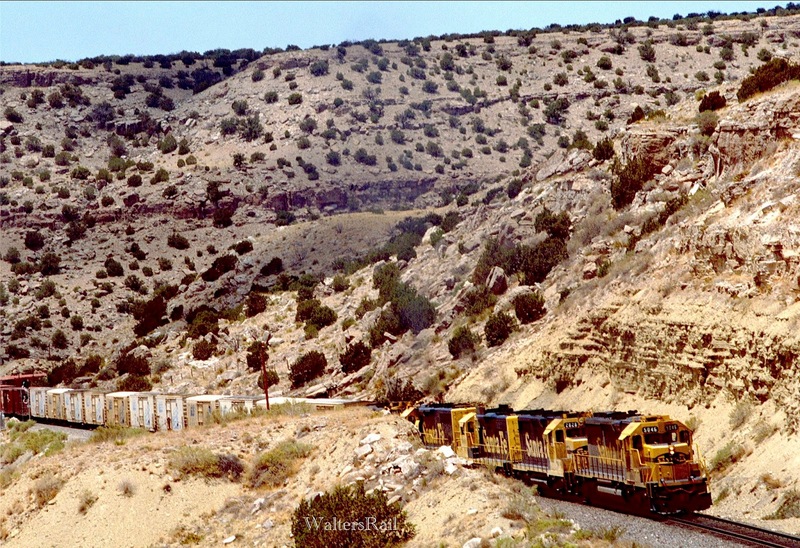 Following are images from the 1980's, all taken in the canyon, illustrating 19th century railroad construction and 20th century motive power. These are images of times long past, but I can honestly remember taking each photo. I remember what the weather was like and what film and cameras I was using (Ektachrome and Nikon FM's). I remember being told in the late 1970's and early 1980's not to shoot Ektachrome, because the dyes would fade prematurely. I now have Ektachrome slides over 40 years old that are just as sharp and colorful as they day they were processed. And I'm still shooting E-6 film today (Fuji Velvia). It will be interesting to find out which goes first -- the E-6 or me. Westtbound at Scholle in June, 1981. In the 1980's, hiking into Abo Canyon was easy and rewarding. You could approach from either east or west. 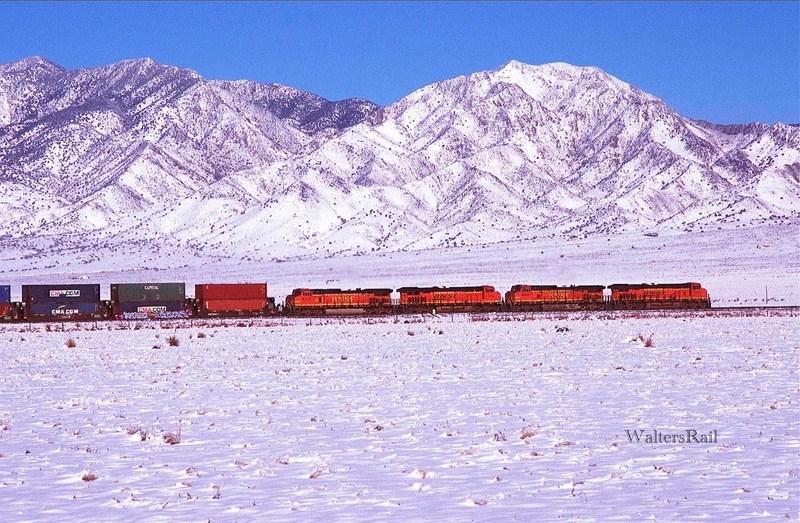 I preferred to park along the highway and enter from the east, climbing the hills on either side of the tracks. In those days, no one lived anywhere near the canyon, and no one cared that you were hiking in the hills. Of course, in those days there was little airport security. Am I indulging in a fantasy of "everything has gone to hell"? I'm sure there is a little bit of that. But life 30-40 years ago was more open and less paranoid. 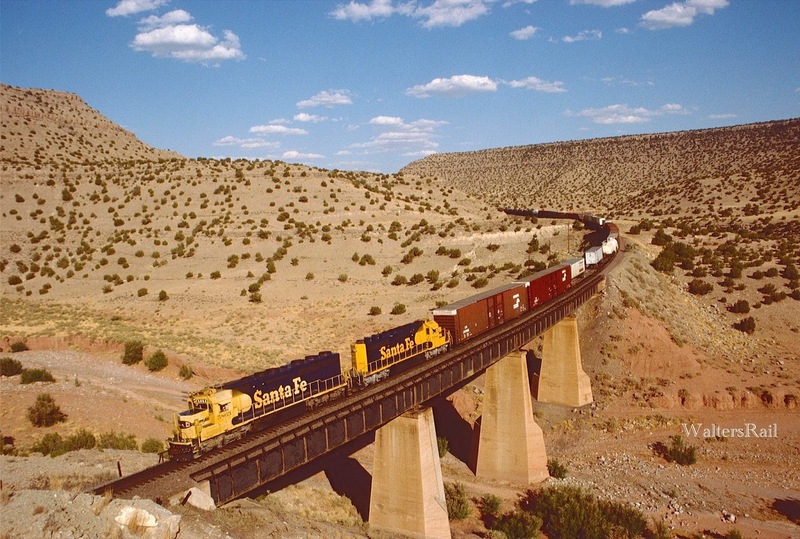 The idea that someone would run me off from a railroad photographic location in a canyon in New Mexico was as absurd in 1980 as the thought that someone would fly an airplane into a skyscraper in New York City. This image was taken in midday in June in 1989. 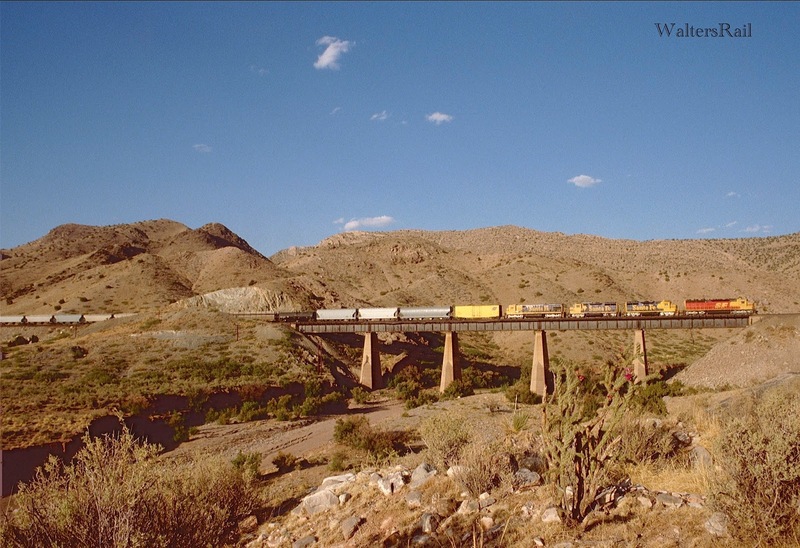 I normally don't bother with shots when the sun is high in the summer sky, but my friend Carl Graves and I had hiked in from the west end of canyon and were determined to obtain images of trains crossing the several bridges. The day was very hot, we had not brought water with us and we got very thirsty. We were both almost 40 years old, so we could not claim to be young and naive. Instead, we were at the age where the energy and excitement of youth are beginning to give way to the lethargy and immobility of old age. It never occurred to either of us that we might get thirsty. We caught a fleet of eastbounds climbing through the canyon. We took a shot at one bridge, then hiked to the next and so on. The trains came about fifteen minutes apart, so we were moving rapidly. As I write this, I am 65 years old, and I still enjoy hiking. If it were possible, I would love to hike into Abo Canyon again. Still, I'm pretty sure I could not keep up the pace that Carl and I maintained in 1989. "Dear Sir: Complying with your request of May 5th to look over the country and report if a line could be had from the northwest point of Wallace's survey in the Sandoval Grant to Isleta, I now report as follows: Absolutely and entirely impracticable. "As this report is rather brief, I submit the following information which I have gathered from a trip around the Manzano Mountains. 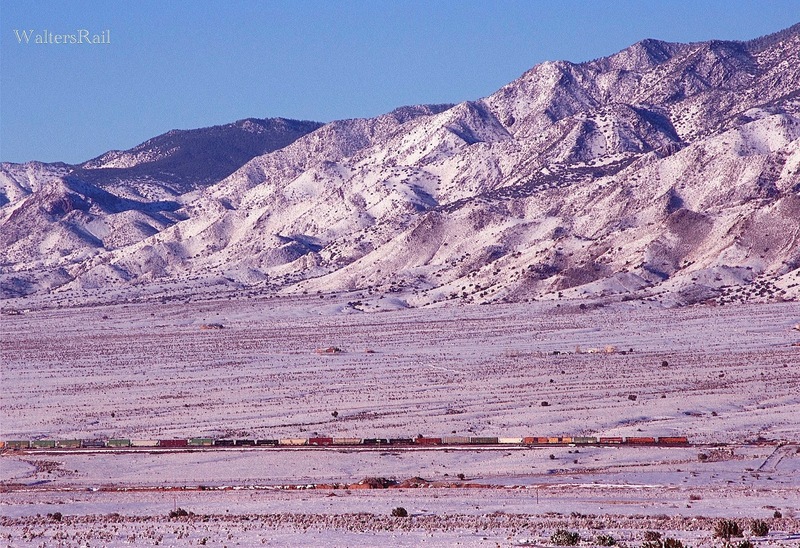 The Manzano, Montoso and Sandia Mountains form a continuous chain, extending north and south about 20 miles east of the Rio Grande. There is no break or opening between Tijeras Canyon and the Abo Canyon. However, north of the Mosca Peak the Manzano Mountains are much lower; in fact, they are not mountains, there being no igneous rock. It is simply an elevation of the horizontal stratified formation. The formation is limestone, merging into porphyry. 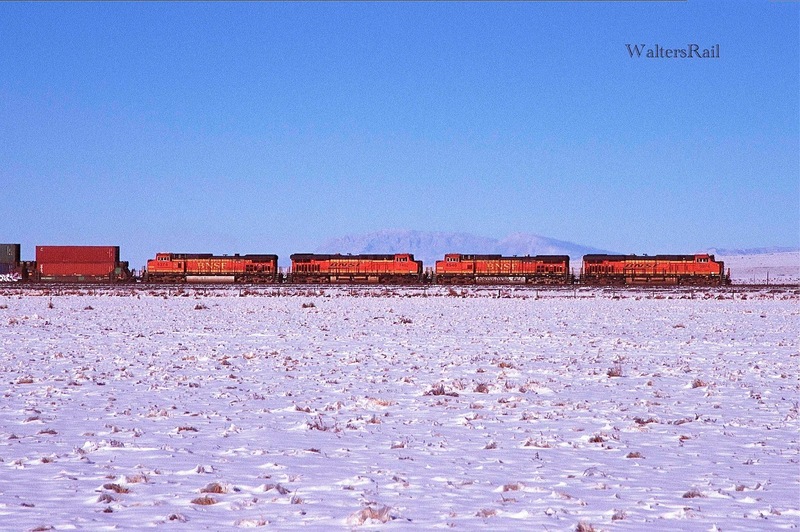 "Through this I had hoped to find an opening, even by going as far north as T.8 N., R.8 E, thence west through Hell's Canyon. There is certainly nothing south of Hell's Canyon, and the following is my best, on that delightful stream. "It is twelve miles long by odometer. It heads up against a north and south divide 7000 feet high, and drops off 600 feet in the first mile, then falls about 80 feet to the mile to the mouth of the canyon. It is not a box canyon, neither is it a canyada; it is more like a crevice in the rock. 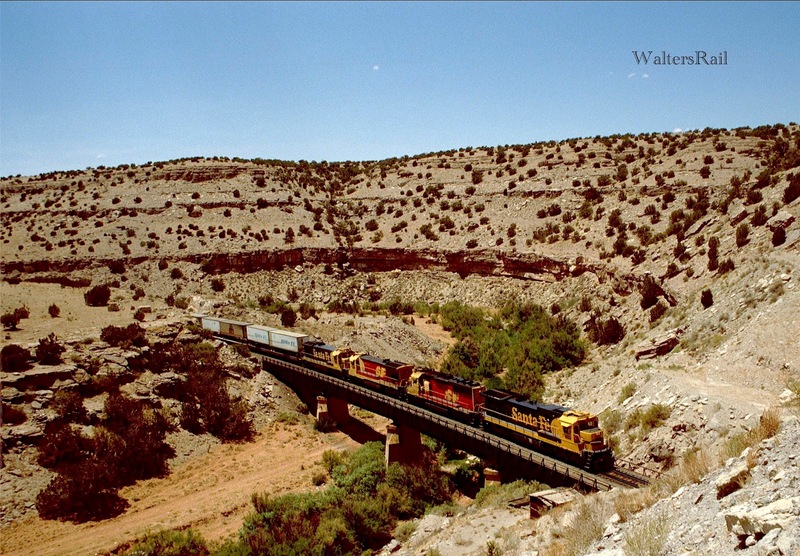 There is scarcely a level place in the whole canyon wide enough to turn a wagon on. "The rocky hillsides go right up from the creek, at about an angle of 30 degrees. The porphyritic points, almost without number, on either side interlock, like cogs on a set of gear wheels. 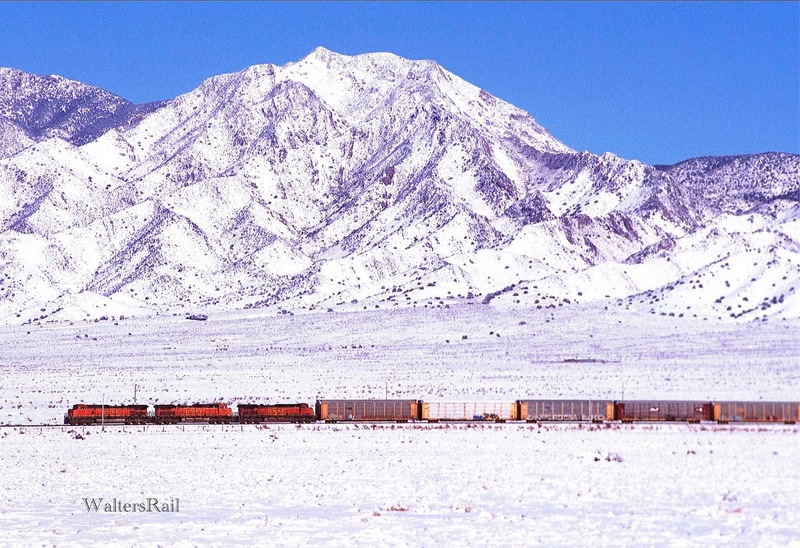 It is barren of a single redeeming quality from a railroad point of view. 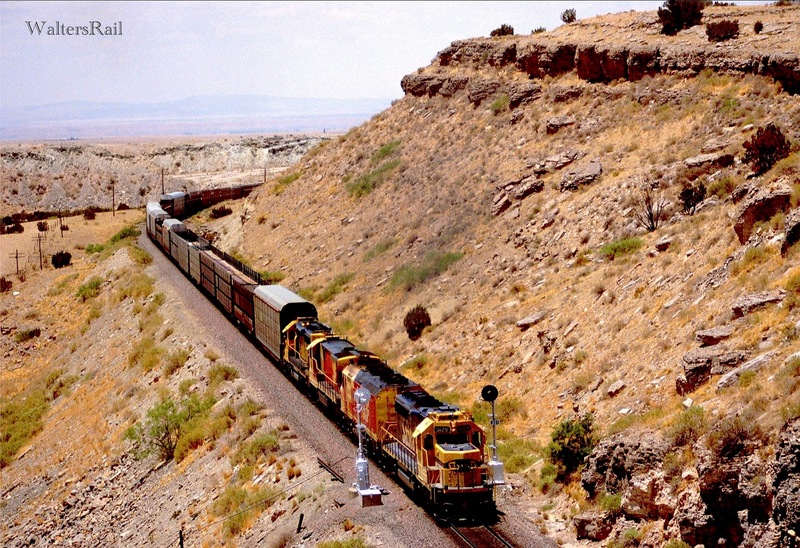 "I feel safe in asserting that no railroad will ever utilize this route. 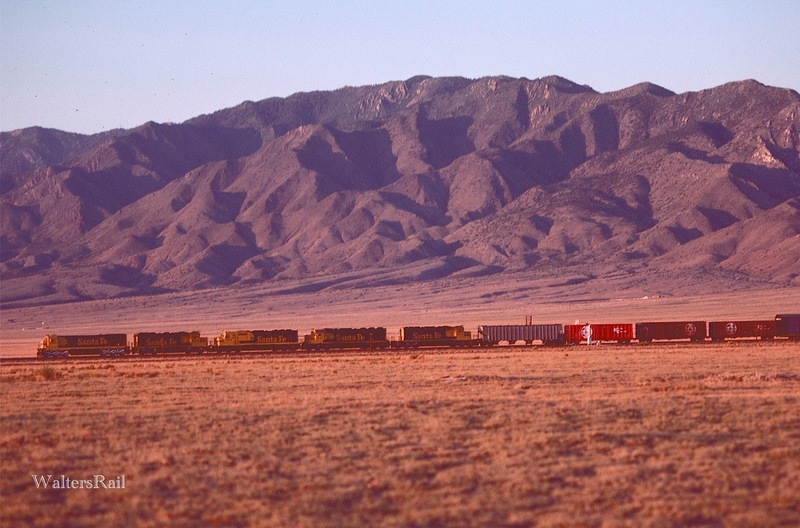 On the other hand I predict that within a very few years, some railroad, if not the Santa Fe, will make use of the Abo Pass. 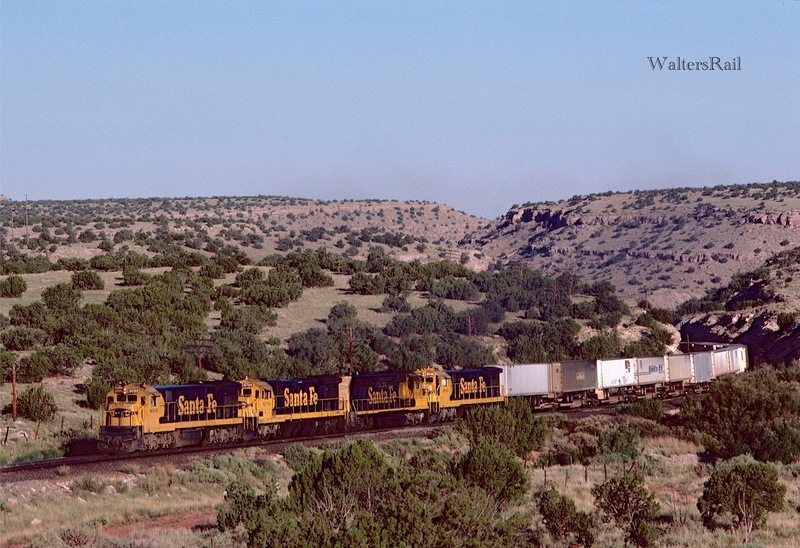 Here is another eastbound entering the canyon in 1989, led by a "Kodachrome" unit. 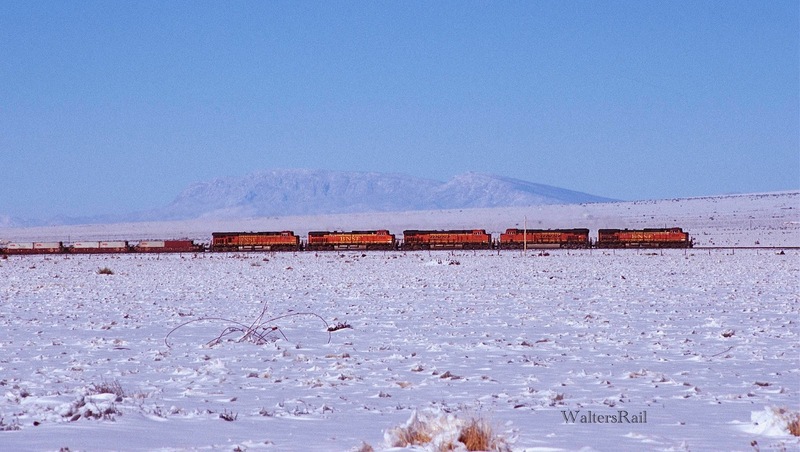 During this time, the AT&SF had announced plans to merge with the Southern Pacific, and a number of units were painted in the bright red and yellow scheme, some with "SF" for Santa Fe, others with "SP" for Southern Pacific. The merger was not meant to be, however, and the colorful units disappeared in the coming years. The political landscape changed enormously thereafter as "deregulation fever" overcame Congress. Railroads merged left and right, as did telephone companies, which I know something about since I practice telecommunications law. Originally, the Bell System was broken up into operating units. Then as merger fever grew, the constituent parts were reassembled through merger until today in 2016, AT&T is as large as it ever was, though it now has competitors, though mostly in the wireless business, which barely existed in the 1980's. The next three images were taken at Bridge Number One in the western entrance to Abo Canyon -- one of the most scenic vistas. In those days, one could drive any vehicle on a good road almost all the way to the bridge, then climb out, take a leisurely hike and find photo opportunities galore. The three images above were all taken in 1989. 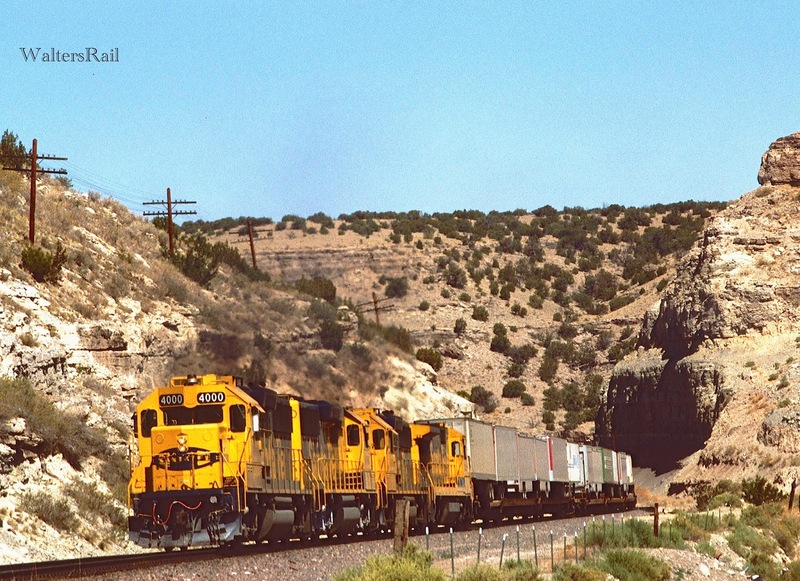 During that trip, Carl and I ran into two other railfans who had signed releases at the Belen Yard Office, thereby obtaining permission to drive along the maintenance roads inside the canyon. Carl and I kept to the hills above where, from time to time, we saw the two fellows in shorts, driving crazily along the rocky roads, jumping out to grab shots, then climbing back into the car and roaring off again, raising dust clouds like canon fire. I would like to remark that I was smart enough not to wear short pants, but my wife has reminded me on numerous occasions that anyone hiking around the desert with cameras and tripods, whether in short pants or not, ought to know enough to keep his mouth shut. 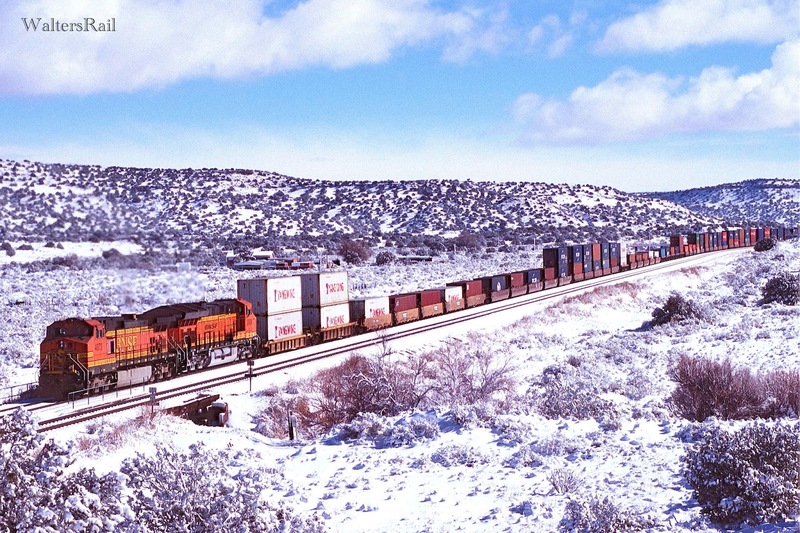 The decision to construct the Belen cut-off must have been difficult for the AT&SF, but Raton Pass in northern New Mexico made all the difference. The summit of the cut-off at Mountainair topped out at 6535 feet, only 1,100 feet lower than Raton Tunnel, but the differences in grades was startling. The maximum grade at Raton was about three percent -- in both directions -- while the maximum grade in Abo Canyon was about 1.25 percent for eastbounds only. 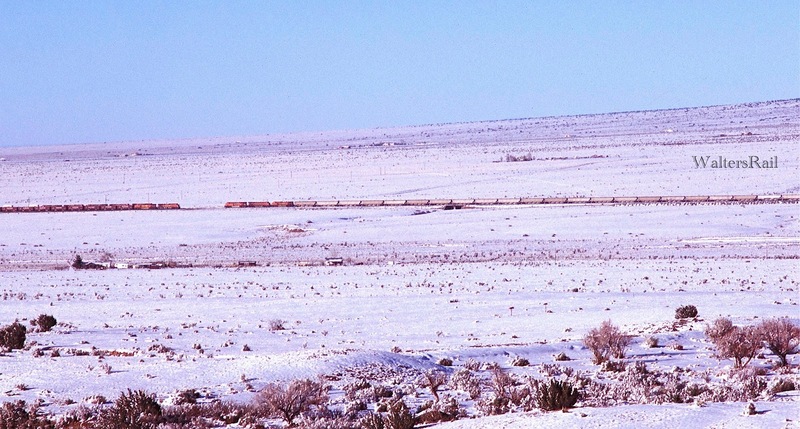 The original surveyor for the Atlantic and Pacific Railroad, William Jackson Palmer, had recognized the difficulties of railroad construction through northern New Mexico and had recommended an alternative route avoiding Raton Pass and following the main branch of the Santa Fe trail from the headwaters of the Cimarron River in far northeast New Mexico southwest to Las Vegas. 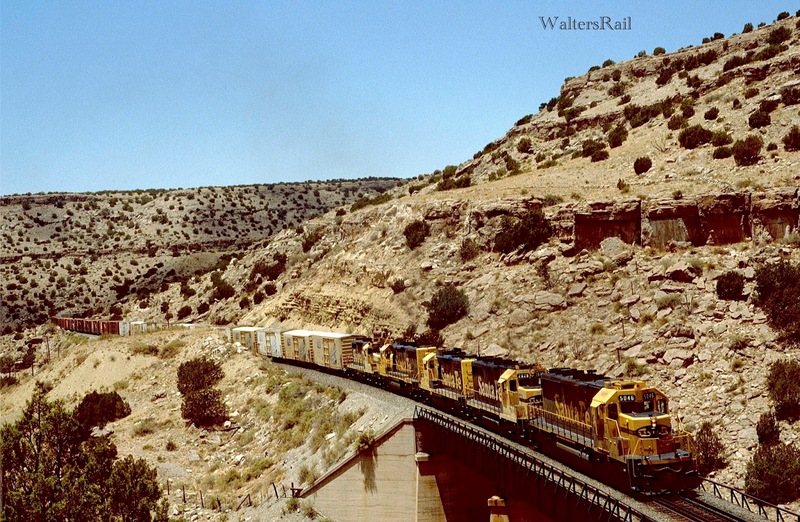 Even though this "Cimarron Line" was not constructed, Palmer had written in 1867 that eventually it or some other more southerly route must be built. Eventually, the AT&SF agreed. As the day drew down, snow on the Manzano Moutains continued to melt. The image above shows how much more rock was visible later in the day. The temperature was falling rapidly, and although my Gortex-lined boots had kept my feet dry, they had not kept my toes warm. I walked back to the Jeep to see if Bear was sympathetic, but instead he was sound asleep. I envy his ability to wake up and fall asleep so quickly. I can do neither. Standing in the snow, I marveled at the early twentieth century construction of the Belen Cut-off. From various sources, I have found a few details. At Moutainair, the summit from the climb out of Belen, the general contractor dug a cut 7,000 feet long, involving 185,000 cubic feet of rock and soil, to maintain a grade of 0.6 percent. 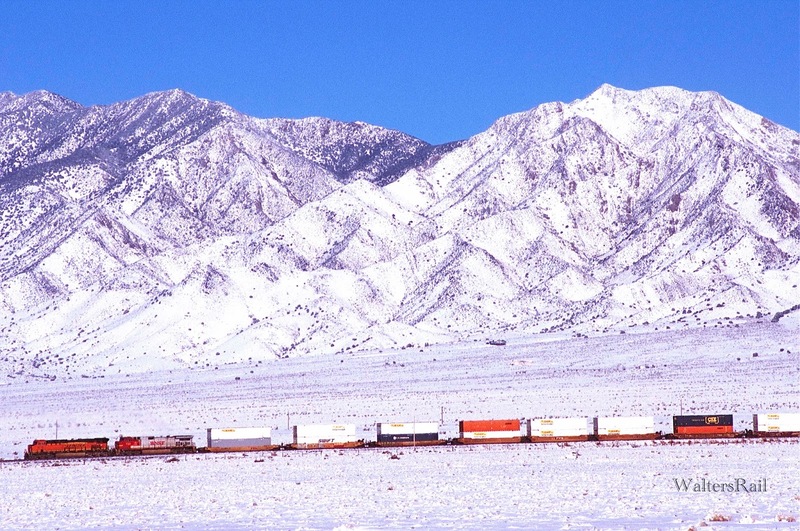 At mile post 74 is a fill of 337,000 cubic yards. At mile post 120, a cut of 9,000 feet was constructed, with a maximum depth of 40 feet, an excavation of 370,000 cubic feet. The material from this huge cut was used at mile post 128, where there is a fill of 870,000 cubic yards ranging up to 50 feet in height. 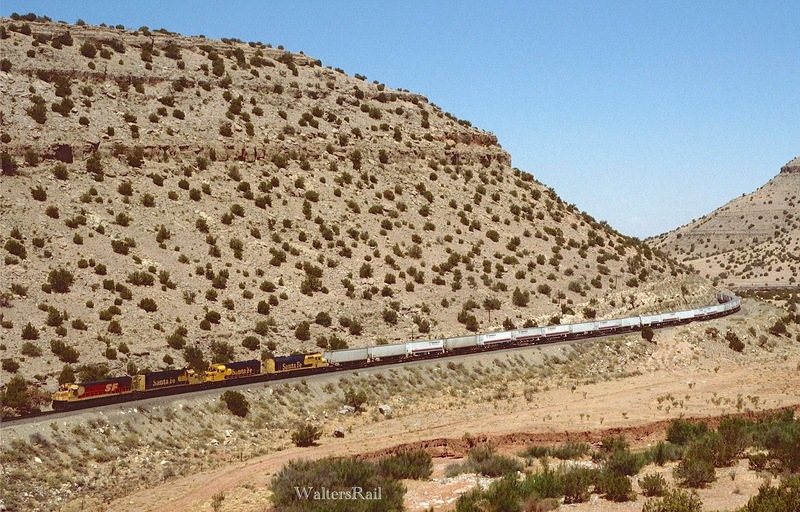 This is the embankment at Vaughn, where the BNSF Transcon crosses above the UP line to El Paso (originally called the El Paso and Northeastern). Until I found these old sources, I had not realized that the "Vaughn Flyover" was part of the original construction of the Belen Cut-off. 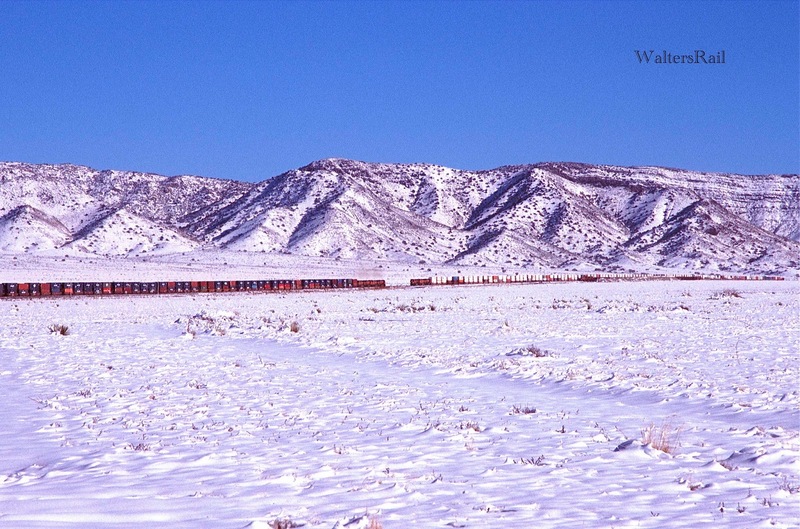 Of the earth for this fill, 500,000 cubic yards were handled by mule teams, while the remainder was loaded on cars with steam shovels. There were seven original bridges in Abo Canyon. All of the bridge piers rested on bedrock. The tallest piers, on Bridge Number One, are 135 feet high, 35 feet of which are below the bed of the stream. Apparently, which I find amazing, no reinforcement was used in any of the concrete structures. The concrete work was done by the Lantry-Sharp Company. The AT&SF furnished the materials and the contractor the labor. The sun was descending rapidly in the pristine New Mexico air. 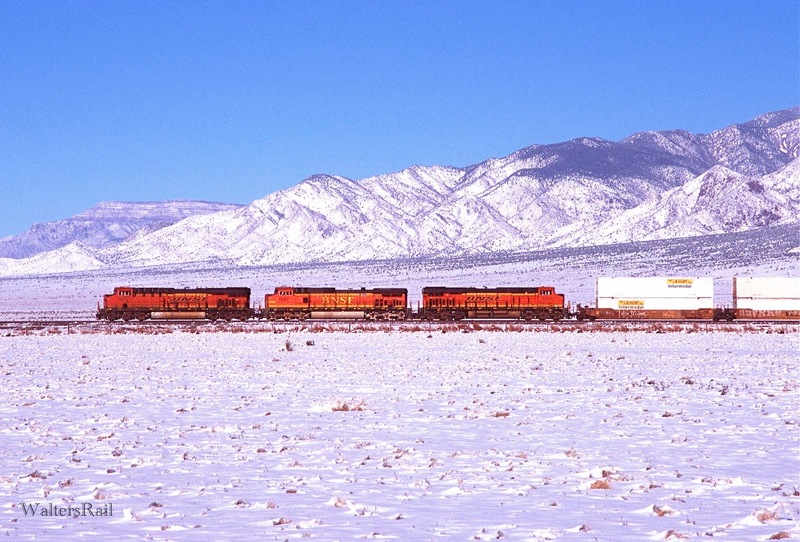 I took multiple images of every train I saw, because I knew I might never take another snow shot in this area. During a break between trains, I walked back to the Jeep. Now Bear was wide awake and wanted to come outside. He hopped down into the snow and began working his way through my tracks to the fence line. He urinated on the fence, then looked at me proudly. "Bear," I said, "you are a great traveling companion." "I love you, too," his look said back to me, "as long as you keep providing food." The sun was going down, and Bear and I returned to the Jeep and prepared for the drive back to the Oak Tree Inn at Vaughn. We followed US 60 up the mountain, and I pulled to the side of the road for one last look. What I saw made me park the car, jump out with my camera, 600 mm lens and tripod and keep shooting. Although the sun was going down, snow was continuing to melt from northwest to southeast, and I could very clearly see the line of demarcation -- as clear and distinct as the "no passing zone" on a two-lane highway. Where earlier I had thought snow had not fallen to the north, I now realized that snow had fallen but then had melted. As I stood on the mountainside above the valley, I thought I could see the melt line proceeding slowly southward. This was almost surely an illusion, but it gave me pleasure, so what the hell! Although I did not return the next day, I am reasonably certain that all the snow had melted before sunrise. That is how snow falls where I live in central Oklahoma -- through the night and early morning. Then it begins to melt in the afternoon and evening, and by the next morning -- all gone. 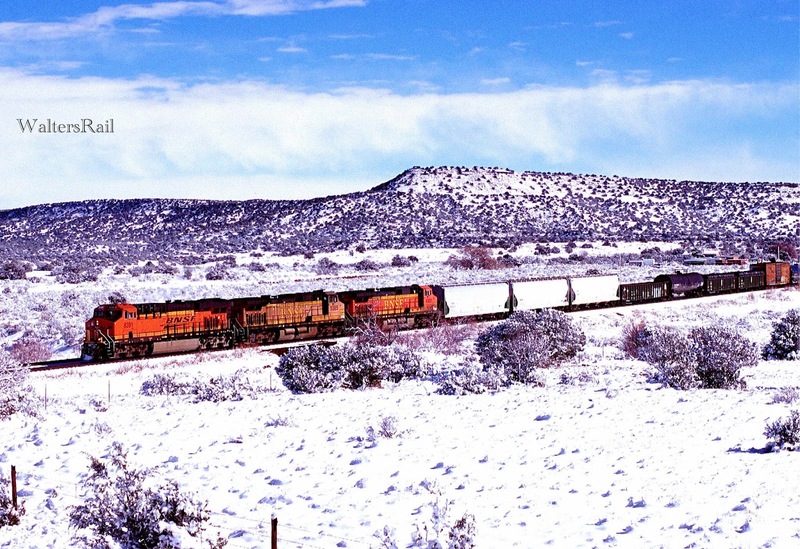 So I was incredibly lucky to catch this much snow in the valley of the Rio Grande. 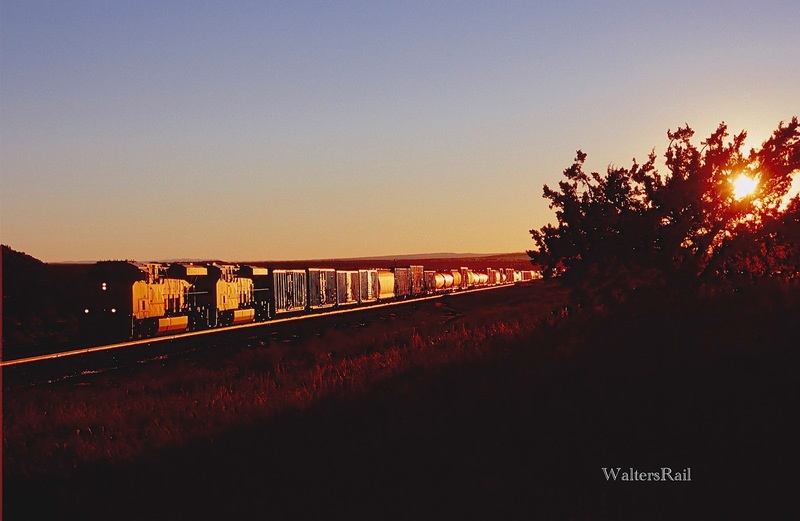 As the sun was setting, I shot an eastbound stack train followed closely by a manifest climbing the grade. Bear was waiting comfortably in the Jeep, while I was jumping up and down in a futile attempt to keep my feet warm. I hiked back to my vehicle, climbed inside and looked at Bear, so cozy and warm and asleep. I was left to pilot the Jeep back to Vaughn and the Oak Tree Inn and reminisce about the old times when one could hike into Abo Canyon without fear of arrest. On U.S. 60 back to Vaughn, we caught up to the same eastbound manifest climbing the grade and took a shot in the setting sun. Here the snow was almost completely melted. 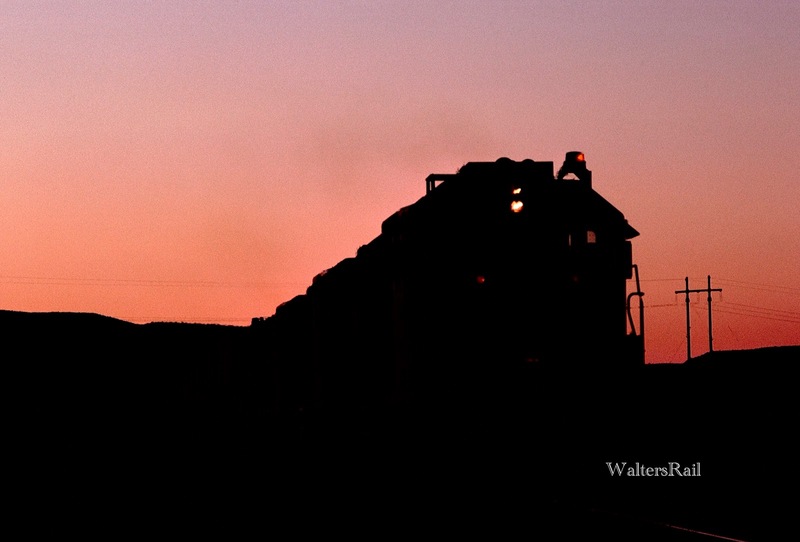 We then drove past Mountainair and took another shot of the same train above a fading orange sky. 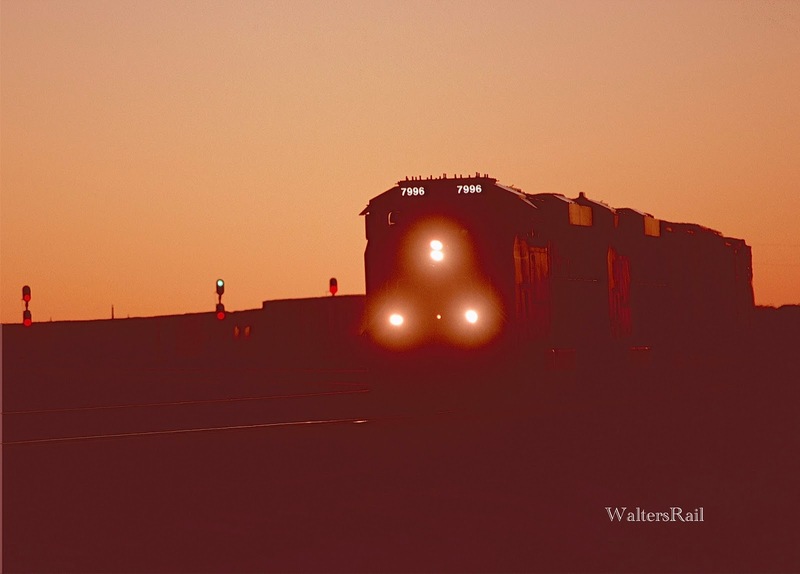 The last image I leave you with is of a westbound AT&SF freight leaving Abo Canyon after dark in 1981. Truly, the lights have gone out.